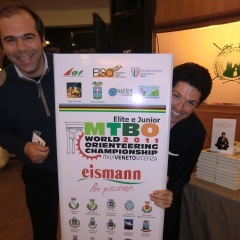 Thanks to the meeting organized by Colli Berici Golf Club and the participation of Matteo Marzotto in the occasion of the presentation of his book "Volare Alto", aimed to raise funds for cystic fibrosis, and thanks to the care of Alessandro Belluscio, Vice-President of Colli Berici Golf Club, we succeeded to introduce ourselves and the project of Mountain Bike Orienteering World Championship to Matteo Marzotto -President of ENIT Italia ( National Agency for Tourism). Surely there will be a concrete collaboration with ENIT finalised to the promotion of the event in North Europe area and dott. Marzotto - fan of Nordic sports, participant of already 13 Vasalopet- might be the tester of the World Championship opening.